I've tried a few different themes and the page break button's words "Next" and "Back" can't be read. It seems the white colors just don't show up. Can you post the URL of the form that has this problem? We can probably fix that. You can also get the full form source code for a particular form and edit it in your favorite HTML editor. Since the words weren't readable, I didn't use the page break function. I did try briefly looking at the source code, but with the CSS I didn't have the patience to experiment. Can you point out exactly where I could change the text color for those buttons, assuming it won't change any other colors? That's what I was afraid of. I'm not a developer. Thanks. BTW, the form program is really great! Good news! It seems the problem was caused by my own web creation software when it previewed the page. So I tried uploading it to the site and it looks fine now. That's the only time the preview function from other software gave me a different result than the actual uploaded page. Try searching for "Next" string on the code you should be able to find the button on the code. How can I change language on "next" "back"? 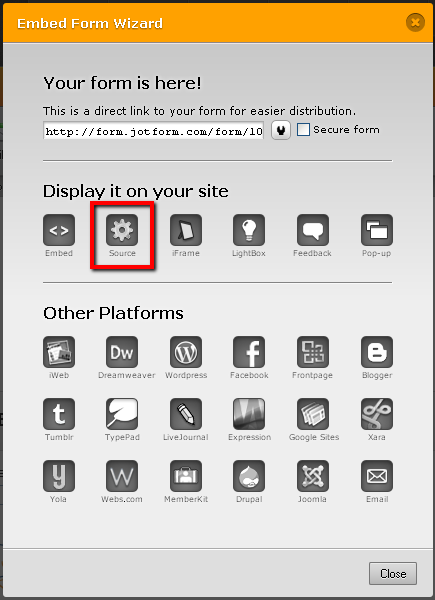 1) Copy the source code of your form in the Embed Form Wizard. 2) Paste this source code into your web authoring software or text editor. 3) Press Ctrl-F to find the word "Back" then replace each occurence with your preferred word (i.e. "précédent" for French). If the word "Back" occured 5 times in your form, you should replace all 5 of them. 4) Press Ctrl-F once again, this time to search for the word "Next" then replace each occurence with your preferred wordv(i.e. "suivant" for French) If the word "Next" also occured 5 times in your form, you have to change all 5. 5) Paste this revised form embed code into your website. We hope you find this information helpful. Please let us know if you need further assistance. In the editor the Next and Back button show up in my own language (Dutch). When the form is embedded in the page, the buttons show up in English. It seems dutch is possible, but how do i get Dutch in the real form. The form URL is http://form.jotform.com/form/11771444181. The URL of the page with embedded from is: http://www.advocaat-kosten.nl/testform.html. Is there somewhere a setting i missed? I was able to confirm the issue you described. My suggestion for you is to use the Iframe embed code instead of the default embed code. 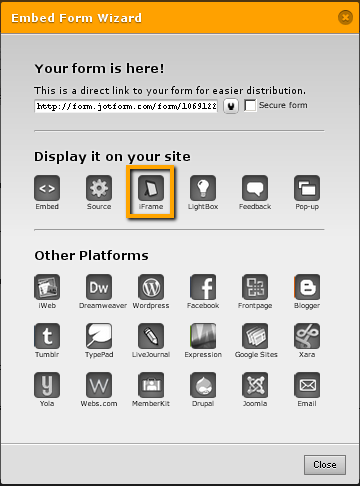 Make sure that the form URL used within the iframe code is http://www.jotform.com/form/11771444181. Please try this tip and let us know if it works for you or not. Thank you for alloing us to help you. I implemented the iframe code and it's English text. When i open up just the URL (https://www.jotform.com/form/11771444181) it's now also English text. Only in the editor it's Dutch. Sorry ARAG, I provided the wrong URL. Please use this URL instead - http://form.jotform.com/form/11771444181. Kindly update us on the results. Thanks again! 1. The height of the iframe is not variable = the height does not change. FOR EXAMPLE: If you click Send and an alert message apears requesting you to fill in a required form element. Result: Send button gone. Look ugly. 2. The form uses pagebreaks. The height of the second screen is higher than the first. What height do i put in the i-frame? This problem cannot be fixed using i-frame. QUESTION IS: Can't i get dutch page break buttons using embed code? Is this a bug? Yes, the IFrame version is limited. Why don't you use the default script code option(Embed) or the Full Source Code option? If you need to use the IFrame option then one possible solution might be to manually increase the height of the form to make sure it covers the largest possible version of the form. Dear JotForm, could you fix the above BUG? If you use Page Break in a non-english language form, the languiage will be NAglish if you use de the default script code. It will be the non-language if you use iframe of full source code. But i and everybody else rather uses the default script code, but that's not possible now! I have submitted a ticket to the development team regarding this bug. They will respond to this as soon as the bug has been fixed. You can now change the page break button texts how ever you like. Just select the page break item on your form and you'll see the two new options on the toolbar.